Hundreds of Philadelphia taxi and limousine drivers blocked traffic around City Hall and snarled Center City traffic for an hour and a half as they honked their horns Dec. 16. 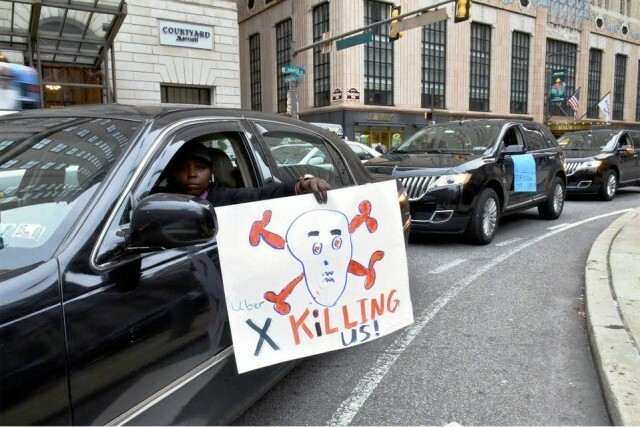 They were protesting the failure of city officials to properly enforce licensing and insurance laws against UberX and Lyft drivers, allowing those illegally unregulated businesses to undermine the ability of taxi drivers to make a living. They were demanding “no more apathy from our public officials” and “a roundtable meeting on the record” with the district attorney, current Mayor Michael Nutter, incoming Mayor Jim Kenny and other officials. The protest was organized by a coalition of UberBLACK drivers, taxicab drivers, and other members of the taxi and limousine industry.